Mende Thuji Yangden is the first student at SAIS from Bhutan. 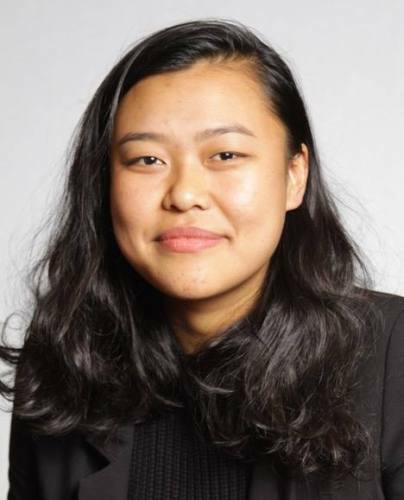 Over the summer, she returned home for an internship in the capital Thimphu, where she helped manage civil society organizations (CSOs) overseen by Her Majesty Gyalyum Sangay Choden Wangchuck. Despite juggling a full-time job, hectic visa applications and family responsibilities, Mende speaks calmly about the historical culture of CSOs in Bhutan, the role of international partnerships in its development and the importance of making time for family and friends. Where were you this summer and what were you doing? I was back home in Thimphu, working for a CSO called the Gyalyum Charitable Trust (GCT), which is one of the queen mother’s organizations. I was a research consultant for two months primarily doing strategic planning for the organization, but, as with any job, I got the chance to branch out. The GCT was formed to coherently manage all the organizations that enjoy the patronage of the Her Majesty Gyalyum Sangay Choden Wangchuck. For example, one of the organizations she formed is called RENEW, which stands for Respect, Educate, Nurture and Empower Women. She works with women’s issues, scholarships for higher education, children from poor socioeconomic backgrounds as well as the textile industry and Bhutanese culture. For the first few weeks, my job was to come up with a strategic plan for the organization and present it to the Her Majesty Gyalyum Sangay Choden Wangchuck and Her Royal Highness Ashim Eeuphelma Choden Wangchuck. Most of my time was spent doing research, understanding problems within the organization and thinking about how to make it financially sustainable. After that, I was carrying out my recommendations in the presentation. A coworker and I also worked together to organize a fundraising event, which was interesting because financial sustainability is one of the major obstacles to CSOs in Bhutan. My work also ventured into creating memos and talking points for the queen mother when she attended conferences on various issues. I was initially only hired for one thing, but that’s the work culture in Bhutan. You don’t only wear one hat. What is the CSO environment like in Bhutan? In Bhutanese culture, the idea of a CSO has always existed—helping communities and the less fortunate, giving away what you don’t need and growing together as a community—but I don’t think anyone has ever conceptualized it as such. The term “CSO” came to Bhutan in the late 1990s, but our first king had this idea of kidu, which means “helping hand” and it’s an ongoing tradition. If you have a problem, the king is supposed to help bear that burden. Historically, it was very uncommon for you to see beggars in Bhutan because you could be homeless but your neighbors would take care of you. So the culture has always been there, but the problem is financial sustainability and management. The CSO culture is very rich, but there are issues when it comes to financing and regulation. What was the most difficult challenge? It was having a full-time job, trying to figure out financial aid for my second year at SAIS and keeping up with my family and friends. The balancing was very difficult. There was so much I had to do constantly—go to the bank or the foreign ministry, visa applications, work full-time, seeing friends—but at the end of the day, family matters in Bhutan. Did it change or confirm your goals at SAIS? Experiencing the CSO culture in Bhutan firsthand really helped me better understand international cooperation. I realized that CSOs are a staple of Bhutanese culture, but what’s changing is the international environment. Bhutan is starting to realize that international partnerships and dialogues are increasingly important. I’ve been focusing primarily on grassroots domestic issues within Bhutan, but the internship showed me that understanding the international arena, particularly in regards to international funding for CSOs, is going to be incredibly important. Do you want to work in Bhutan eventually? Yes, definitely. I feel like it would be a waste of an education for me to study at SAIS and not take what I’ve learned to Bhutan. There aren’t a lot of us. I have to support my country.